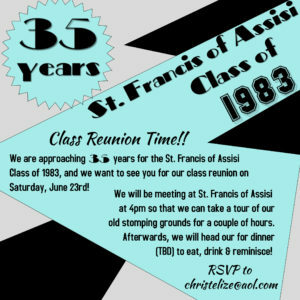 We are approaching 35 years for the St. Francis of Assisi Class of 1983, and we want to see you for our class reunion on Saturday, June 23rd, 2018. 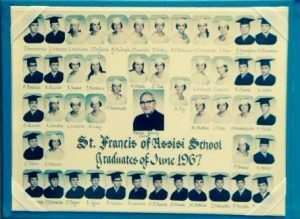 We will be meeting at St. Francis of Assisi School at 4pm so that we can take a tour of our old stomping grounds for a couple of hours. Afterwards, we will head out for dinner (TBD) to eat, drink & reminisce! See old friends, bring pictures & reminisce! Help spread the word to your classmates. Spouses & Partners are welcomed!